WEBINAR SUMMARY: As part of the KBI-Oregon State University Genomic and Analyte Study [Summer 2018], Keisha Rose Harrison will be hosting a webinar review to summarize the study results and Kombucha fermentation science. What was the objective of the study? OSU is interesting in characterizing the diverse microecology of the commercial Kombucha SCOBY and the chemical composition of Kombucha tea. The flavor attributes and alcohol produced during the process are governed by the starter colony, a symbiotic culture of bacteria and yeast (SCOBY). The limited information about the composition of the Kombucha culture and the components of the end product make it cumbersome for producers to quantitatively troubleshoot. In the conventional brewing approach, there is no identification of inoculating cultures nor monitoring of culture consistency. Through this study we aim to identify common ecological and metabolic markers. WEBINAR TAKEAWAY: What will be gained from the webinar? Study participants will get an overview on how to best interpret their results. Group results will be presented in a meaningful way as to illustrate main ecological drivers and potential sources of divergence. Additionally, there will be a larger discussion on how the results may direct quantitative approaches to troubleshooting in production. Note, specific brewing questions that do not pertain to the study will not addressed. Keisha Harrison, M.S., is a PhD candidate of Fermentation Science in the Food Science & Technology Department at Oregon State University (OSU). She received a Bachelor of Arts in Cell Biology and Biochemistry from Rice University and a Master of Science in Nutrition from the University of Houston. Keisha was drawn to Kombucha research because it is a beautifully complex system to study microbial interactions. She aims to understand the links between the microbial landscape of the Kombucha SCOBY and the sensory experience. She believes to get at the heart of Kombucha, we have to get better acquainted with it first! 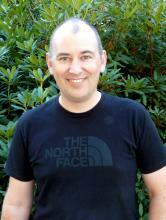 Chris Curtin, Ph.D. is an Assistant Professor in the Food Science & Technology Department at Oregon State University (OSU). Prior to joining OSU in 2016 he lead the Biosciences research group at the Australian Wine Research Institute, where he was responsible for development of yeast strains and development of strategies to mitigate spoilage. The Curtin lab seeks to understand the role of yeasts and bacteria in production of fermented beverages, where often the same mix of species give us an array of possible outcomes. The Kombucha SCOBY embodies this complexity and has become a major focus of our research. Explore the microscopic world at work when sweetened tea becomes kombucha. During this webinar session, members of KBI will receive information on the biochemistry and microbiology of standard kombucha fermentation. 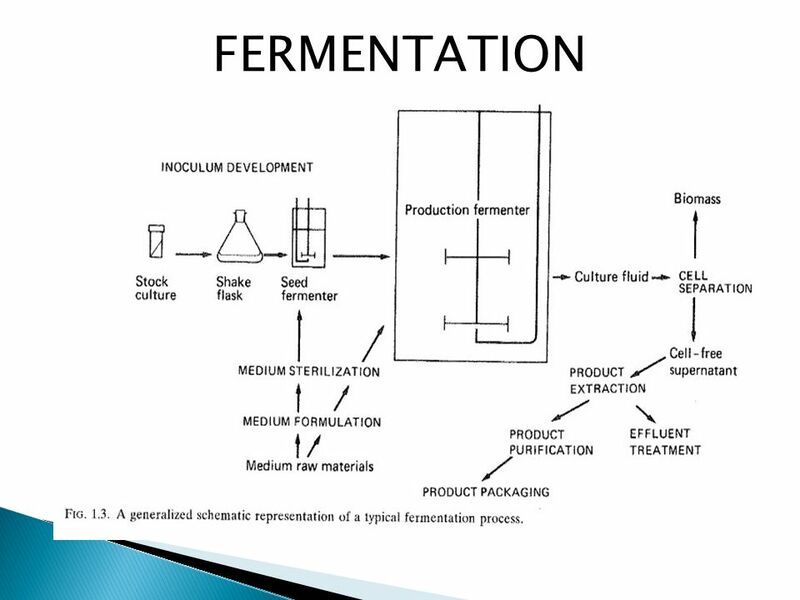 Webinar topics include yeast and bacteria strains, fermentation kinetics, the kombucha microbiome, chemical composition, and microbiology techniques. Learn more about how to apply laboratory techniques such as plating of cultures, isolation of microorganisms, and PCR. Enrollment is FREE for KBI members currently participating in the Oregon State University Kombucha Genetics and Analyte study. The Kombucha SCOBY: A Symbiotic Culture Of What Exactly? Kombucha, a funky fermented tea, is a time immemorial beverage that has made appearances across the globe in various forms for eons. This beverage of unknown origin is shrouded in many mysteries. The potential health benefits, fermentation kinetics, and alcohol production are a few aspects that continue to baffle kombucha lovers and producers alike. Meanwhile, one area where fermentation researchers are making ground is in defining the microbiology of the Kombucha SCOBY. In comparison to other fermented beverages, i.e. wine and beer, the amount of research done on the Kombucha SCOBY is sparse. It was known in even the earliest studies, from back in the 1960s that the starter colony was made up of both yeast and bacteria. However, there was little known about which organisms drove the fermentation, contributed to flavor, and fought off spoilage. Until recently, scientists relied upon culture-based methods (isolating microbes on media plates) to identify yeast and bacteria organisms. This technique, although cost-effective and accessible, is prone to error. 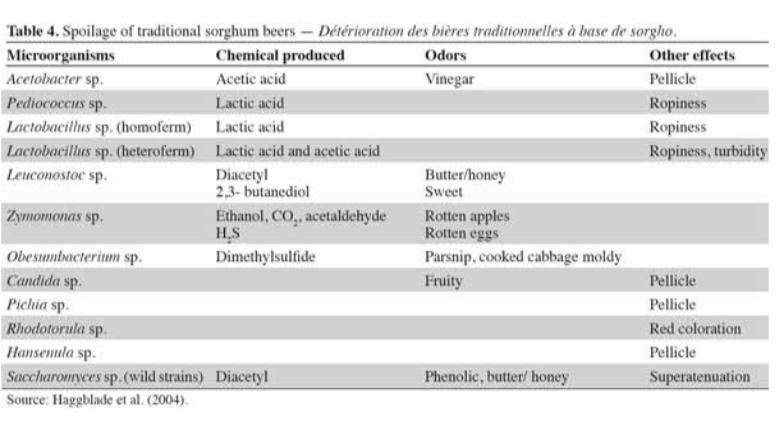 Despite its limitations, scientists (Teoh et al, 2004; Liu et al, 1996), were able to come to consensus about the role of acetic acid bacteria (AAB) and saccharolytic (“sugar eating”) yeast. By the early 2000s, we understood that AAB converted ethanol to acetic acid and built the SCOBY. Acetobacter and Gluconoacterobacter, genera of AAB, were claimed as staples and have since been renamed to fit under the genus Komagataeibacter. There was less agreement about which yeast cells eat cane sugar to produce simple sugar hexoses for the bacteria. There are accounts of Zygosaccharomyces, Schizosaccharomyces, Brettanomyces, and Candida. However, Teoh (2004) warns us that identifying organisms based upon isolation methods is generally unsuccessful. 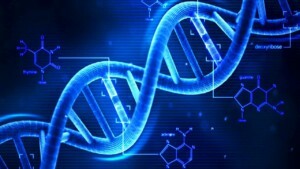 The DNA sequencing boom changed the name of the game! With the advent of affordable and reliable genetic sequencing, high-resolution taxonomic identification became a thing of reality. First scientists used sequencing technology to characterize isolated organism as a more robust culture dependent approach. However, with next generation sequencing (NGS), we could finally for the first time identify both culturable and nonculturable organisms. With NGS technology, scientists confirmed Komagatebacter as the dominant Kombucha bacteria (Marsh, 2014; Chakravorty, 2016) revealed that lactic acid and thermophilic bacteria that are likely dependent upon Kombucha preparation and region. 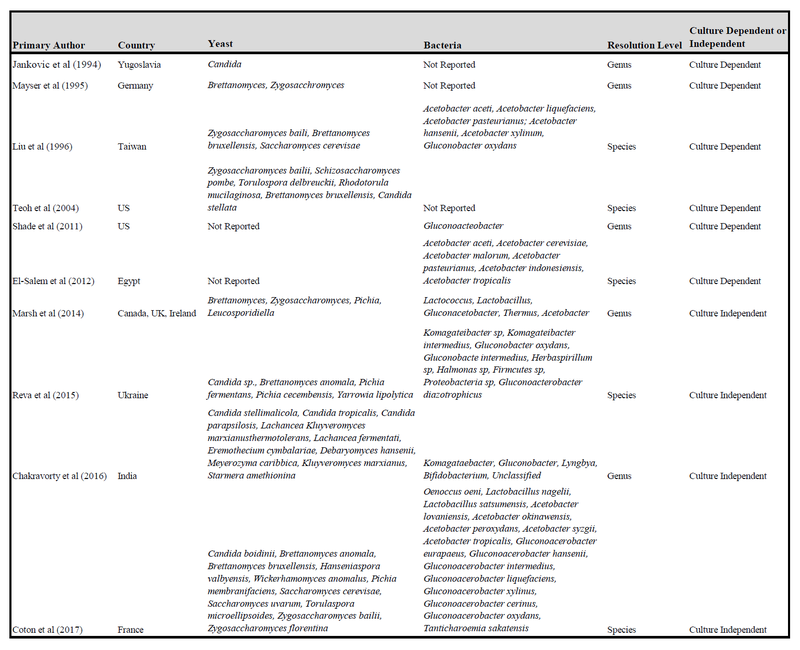 (See table below for comprehensive list of evaluated microorganisms) These studies finally give us an in-depth analysis of kombucha microflora. What does this mean to brewers? The recent application of advanced sequencing proved that we can apply high-fidelity identification tools to kombucha. With the precedent already set, we can now focus on designing experiments that address the larger questions. For instance, “what is common to commercial SCOBY?” and “which organisms are found in kombucha with high organic acid production?” By sequencing a mass number of SCOBY from around the globe, we will have the potential to link microbes with the chemical composition of finished kombucha products. Additionally, we will get closer to curating reproducibility and troubleshooting problematic batches. How you can get involved? KBI members have the opportunity to participate in highly discounted genetic sequencing ($125 per sample) of the Kombucha SCOBY and broth. Fermentation scientists at Oregon State University and creating a database of microbial populations from commercial kombucha. Not only will you have the opportunity to see what your SCOBY is comprised of, but you will also be able to see your powerhouse compares to the average SCOBY. This is just the first step in understanding how the microbial population relates to kombucha features. Coton, Monika, et al. “Unraveling Microbial Ecology of Industrial-Scale Kombucha Fermentations by Metabarcoding and Culture-Based Methods.” FEMS Microbiology Ecology, vol. 93, no. 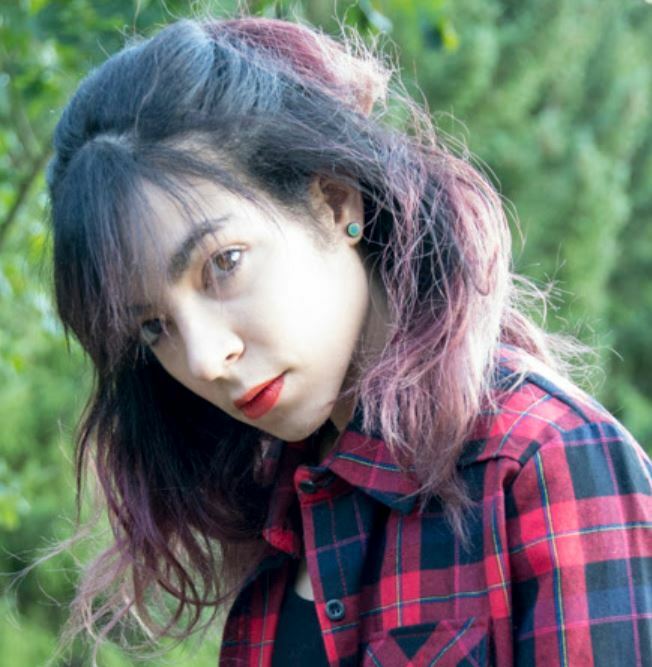 5, 2017, pp. FEMS Microbiology Ecology, 2017, Vol. 93(5). Chakravorty, Somnath, et al. “Kombucha tea fermentation: Microbial and biochemical dynamics.” International journal of food microbiology 220 (2016): 63-72. El-Salam, S. S. A. (2012). 16S rRNA gene sequence detection of acetic acid bacteria isolated from tea kombucha. New York Science Journal, 5(3), 55-61. Jankovic, I., Stojanovic, M., 1994. Microbial and chemical composition, growth, therapeutical and antimicrobial characteristics of tea fungus. Mikrobiologija 33, 25 – 34. Liu, C-H., et al. 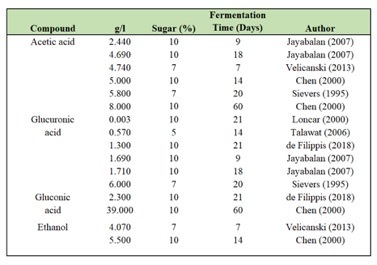 “The isolation and identification of microbes from a fermented tea beverage, Haipao, and their interactions during Haipao fermentation.” Food Microbiology 13.6 (1996): 407-415. Marsh, Alan J., et al. “Sequence-based analysis of the bacterial and fungal compositions of multiple kombucha (tea fungus) samples.” Food microbiology 38 (2014): 171-178. Shade, Ashley, D. H. Buckley, and S. H. Zinder. “The kombucha biofilm: a model system for microbial ecology.” Final report on research conducted during the Microbial Diversity course. Marine Biological Laboratories, Woods Hole, MA (2011). Teoh, Ai Leng, Gillian Heard, and Julian Cox. “Yeast ecology of Kombucha fermentation.” International journal of food microbiology 95.2 (2004): 119-126. 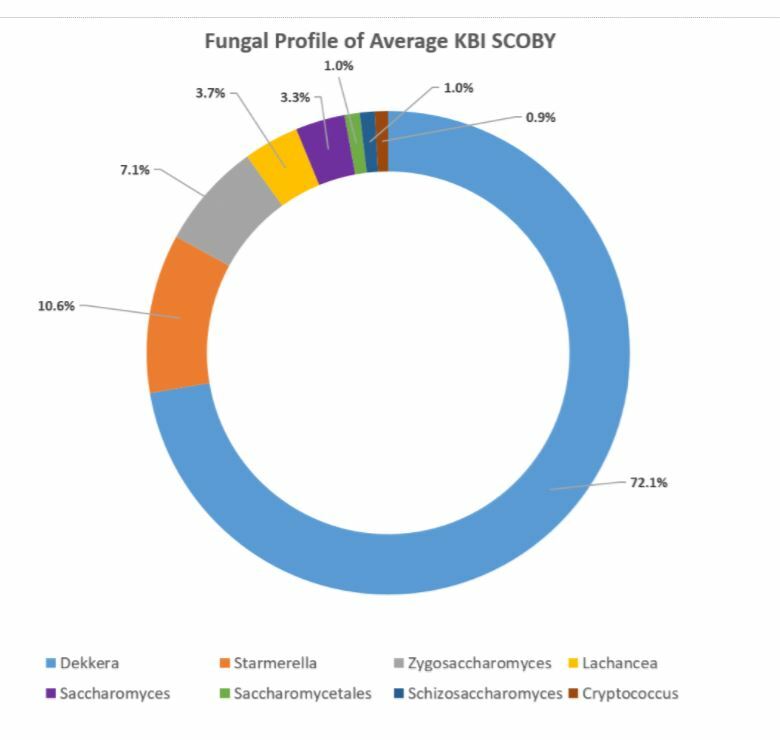 KBI is excited to launch the next phase of the KBI OSU SCOBY Genomics Study – part two. Building on the data gathered in the first study and reported about here, we are calling for new samples of SCOBYs & starter liquid from any Kombucha producer around the world. Keisha-Rose Harrison, PhD student at Oregon State University is continuing the original study to learn more about the organisms present in Kombucha cultures through DNA Sequencing. In an effort to gain a deeper understanding of what the role of the various organisms may play in the fermentation process, we are also adding an analyte analysis to this new study. For the analyte study, we will be using nuclear magnetic resonance (NMR) technology to evaluate the chemical profile of finished kombucha products. This rare piece of equipment has the efficiency to detect any residual sugars, amino acids, organic acids, and vitamins within your brew with high fidelity. This a great opportunity to get at the heart of what defines your unique kombucha brew! The overarching goal of this project is to take the information we have about the organisms present in the culture via the DNA Sequencing study and combine that with the knowledge of which analtyes are being produced to start to piece together how the different flavors and qualities of our brews match up with the range of chemical compounds within kombucha. Your participation will contribute to the general definition of kombucha. HOW TO PARTICIPATE IN THE STUDY – We are no longer accepting submissions for this study. We are aiming for 200+ total samples to be analyzed in order to have a sufficient pool to draw conclusions. We invite you to take advantage of this opportunity to learn what is in your culture while also contributing to the deeper body of knowledge about Kombucha as a whole. Furthermore, your submission will be kept confidential and you will receive an individualized chemical analysis report. Similar to the Kombucha Genetics Study, following the release of individual reports, a KBI blog report will be written to contextualize your results within the frame of the population. If you are a current KBI member, the cost is only $125 per sample for each test – you may choose to participate in only the DNA Sequencing, only the Analyte Analysis or both for a discounted price of $200 per sample. Part of the cost goes directly to the university to cover the sequencing, part of it is to cover shipping of kits and the purchase of the kit supplies and the rest covers administrative costs. Non-KBI members are also invited to participate!. The cost is $250 per sample for non-members with a discounted price of $450 for both. Or join KBI today to receive the member pricing. DNA sequencing typically costs several hundred up to thousands of dollars per sample, so this is a significant savings for valuable information. The data will only ever be presented in an aggregate format to protect confidentiality for all participants. The analyte study will include over 20 different analytes providing a huge savings over testing them individually with private labs. Thank you to everyone who participated in the first round of the KBI & Oregon State University Kombucha SCOBY DNA Sequencing study. With your help we sequenced nearly 100 samples provided by over 70 different companies from 26 states and 9 different countries around the world. The largest SCOBY DNA Sequencing Study to date! Previous studies that sought to improve our knowledge of SCOBY microbial populations have been more limited in scope. We now have more data points which can provide a clearer understanding of which microbes are common across commercial SCOBYs, and an opportunity to learn which strains may be responsible for different fermentation and flavour outcomes. For each sample received, we blended a standardized amount of SCOBY under controlled conditions, and then extracted the DNA from all microbes present in the sample. Regions of DNA that can be interpreted as ‘barcodes’ were amplified from each sample and sequenced using Illumina Miseq technology. The sequences of these ‘barcodes’ were compared to large databases of fungi and bacteria, and assigned to Operational Taxonomic Units (OTUs). In this study OTUs were defined at a standard cutoff of 97% similarity. 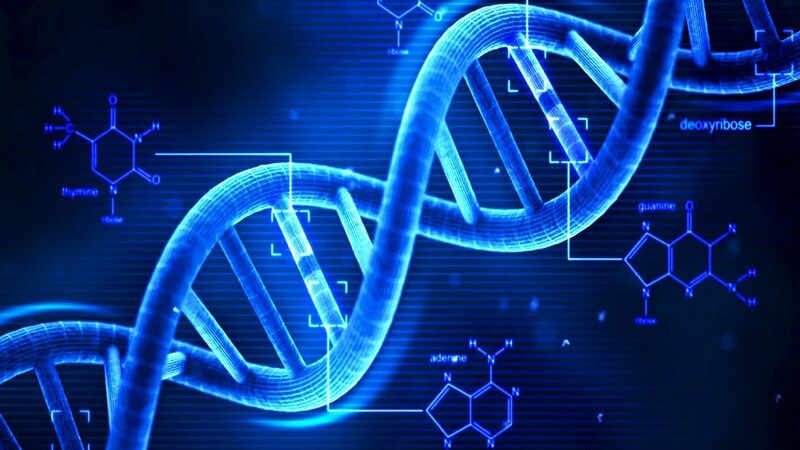 In other words, if two ‘barcodes’ are only 96% similar in DNA sequence they would not be grouped into the same OTU. Is an OTU representative of a species? Sometimes yes, but often no – within many genera (particularly for bacteria) individual species cannot be reliably differentiated using current DNA ‘barcodes’. This approach is highly robust when used to provide resolution at the genus level, meaning that all OTUs for one type of organisms are grouped together. For example, if a SCOBY contained both Lactobacillus casei and Lactobacillus plantarum their DNA ‘barcodes’ would be grouped together as Lactobacillus. After the samples are matched at the genus level, each ‘barcode’ detected is counted to provide the frequency with which it appears in the sample to determine the proportion at which each genus of the whole bacterial or fungal population exists. These are the numbers of the sample represented as as follows: Dekkera 0.67 means that 67% of the fungal population in your sample belongs to the Dekkera genus. 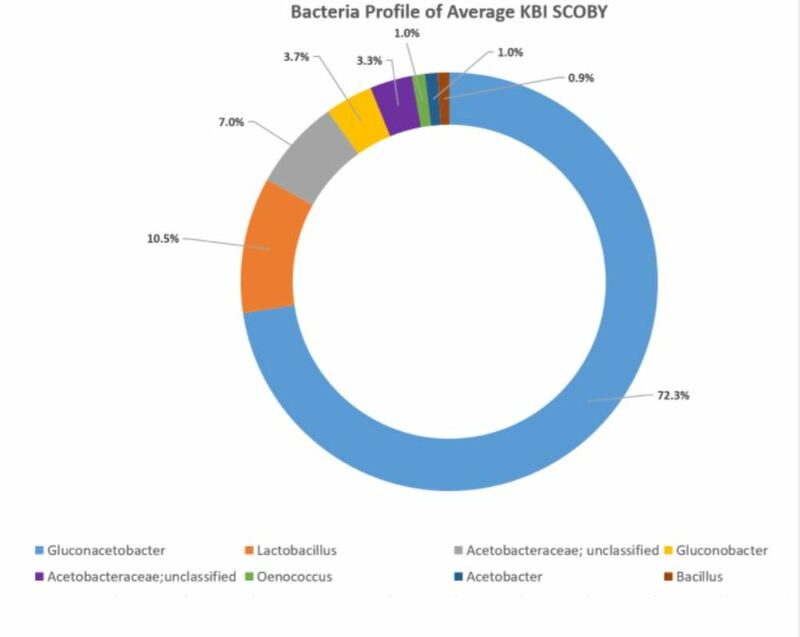 Each sequencing report provided participants the bacteria and fungi profile of the sampled SCOBY. 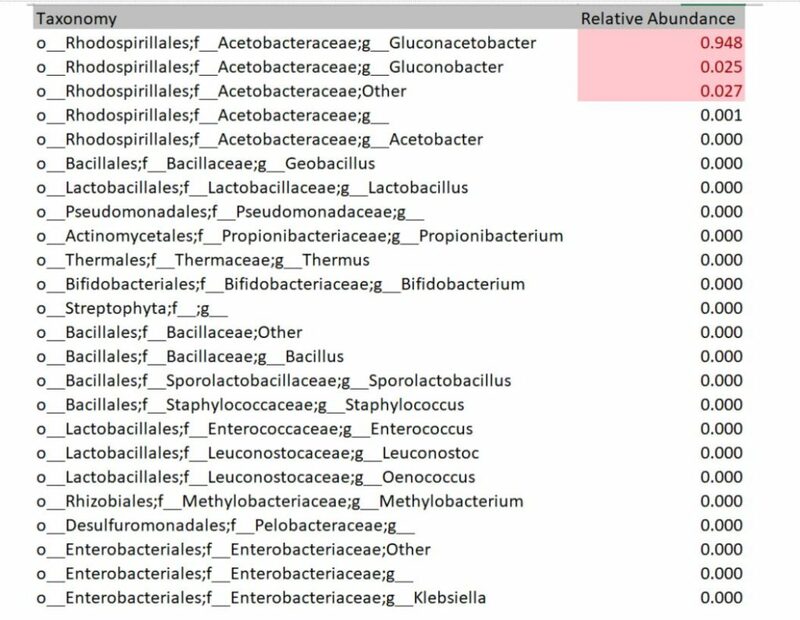 Below is an example of a report of bacteria detected. The genus level is read as “g_GENUS”. The number provided indicates how much of bacteria was present in the sample. 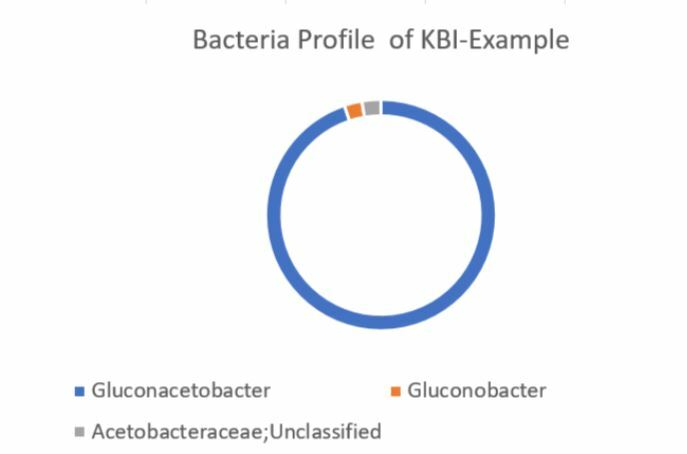 For instance, 94.8% of this example sample is Gluconoacetobacter. 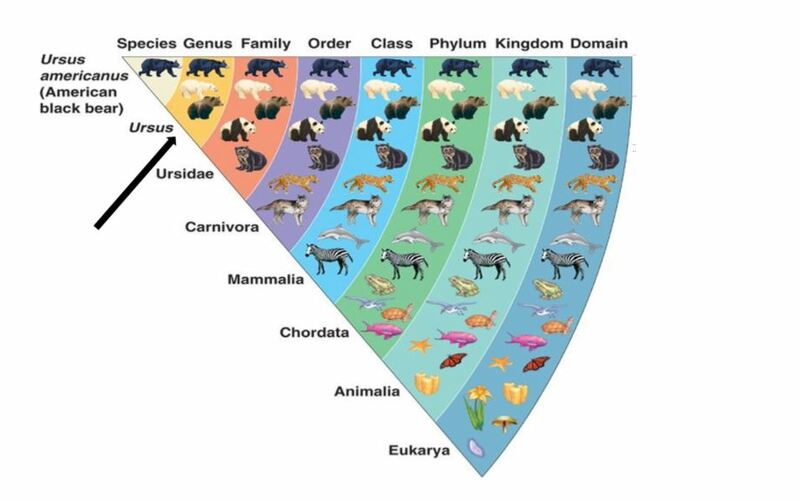 Some other OTU groupings could not be reliably defined at genus level, in which case they will be named at family level but assigned as ‘Other’ or ‘g__’ at genus level. 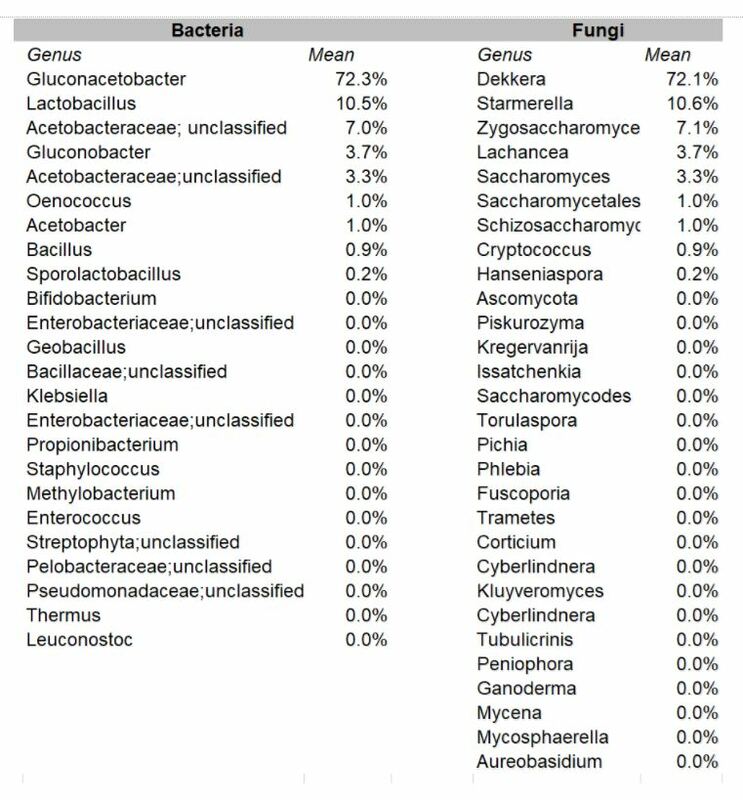 In this example, 2.7% of the bacterial population is made up of bacteria within family Acetobacteraceae that could not be assigned to a genus. Using the values provided we can create a visual of the bacteria composition. Please note that the taxonomic name of organisms can change. For example, Dekkera is now known only as Brettanomyces (previously the names were interchangeable), while Gluconoacteobacter xylinum and Acetobacter xylinum have been reassigned to Komagataeibacter xylinum. We’re sorry, but this is just as confusing for seasoned microbiologists! A: Sometimes ‘barcodes’ are not able to be definitely assigned at the genus level due to a lack of resolution or because the sample may contain a species that has not yet been identified by the microbiology community. These OTUs are then grouped at the family level and genus may be given as ‘undefined’, ‘unknown’ or ‘other’. Each company received an individual report listing the respective percentages of each type of bacteria and yeast found in their sample. As presented at KombuchaKon18, results from the study confirm that there is variability in SCOBY samples collected from different brewers. However we were able to identify core microbes that are present in most SCOBYs. On average, the most common fungi were Brettanomyces/Dekkera and Starmerella, while the most common bacteria were Gluconacetobacter, Gluconobacter, and Lactobacillus. The near constant fluctuation of organism name changes presents its own kind of challenge. In previous SCOBY & Kombucha DNA Sequencing studies, for example, there are no instances of Starmerella being detected, however, when doing cursory research, it turns out this is a newer nomenclature for many species that used to be known as different types of Candida spp. which have been identified in other studies. However, without going to the species level, it is difficult to ascertain which stains correspond to those found in previous studies versus which may be novel to Kombucha. HOW DOES THIS INFLUENCE FLAVOR AND FERMENTATION? Identifying the prevalent organisms within the SCOBY is the first step towards answering this question. We do know that different types of yeast convert sugar to alcohol at different rates. It is also known that different types of bacteria produce varying kinds of organic acids in similar fermentation models, i.e. beer, wine (see table below). There is likely some overlap in how these microbes influence kombucha. For the next study, we aim to determine how different microbial profiles influence your finished raw product. Continued participation in these studies will go a long way to addressing these questions. In the meantime, some of the organisms found in Kombucha are also found in wine & beer. Here are some links to charts that outline the flavor profile and characteristics of some of those organisms. Our yeast and bacteria are considered spoilage for beer & wine! ARE SCOBYs MORE VARIABLE IN THEIR BACTERIA OR YEAST POPULATIONS? On the whole, there seems to be more variability in the bacteria profiles of SCOBY samples. Bacteria are responsible for converting most of the ethanol into organic acids and for building the SCOBY. We will continue to study how different types of bacteria influence the secondary fermentation. For this study we only examined the SCOBY and not the starter fluid. For the second sequencing study we will look at both! As mentioned in the presentation at Kombuchakon, acetic acid bacteria build the the SCOBY. They do not have to live in the SCOBY to produce acids (e.g. vinegar is made without a SCOBY), just as yeast do not have to live in the SCOBY to degrade sugars. The SCOBY does, however, enable repeated fermentations to be started with multiple species present, something that would be difficult to achieve otherwise. The SCOBY effectively buffers microbes against what would otherwise be a fluctuating environment as the sweet tea goes through alcoholic fermentation and acetification. .
At the time of sample collection, a couple of questions were asked in order to analyze the data according to a couple of variables – namely age of the culture sampled and location. We then sent out a follow up survey for additional metadata including age of the culture sampled, type & quantity of tea; type & quantity of sugar; and batch size to see if the data would show any trends or patterns based on these variables. Not all participants answered this part of the survey and we hope to have a more thorough Metadata Analysis available in future studies. This will greatly enhance the applicability of study results to the KBI community. Preliminary analyses suggest there may be some region-to-region variances in the bacteria and fungal composition of the SCOBY, though it should be noted that sample numbers and the amount of metadata provided were uneven. Future studies will request additional metadata in order to determine the influence of types & quantities of tea, sugar and other variables. KBI & OSU will be partnering on a new DNA sequencing study and will also be conducting an analyte study. We hope to receive at least as many samples as last time if not more so that our knowledge base will continue to deepen. Stay tuned for more details coming soon! Drop an email if you are interested in participating in this study. Contact Mike Goodrich with Cornerstone Analytical for all of the details at (888)313-1937 or mike.goodrich@cornerstoneanalytical.com. After sequencing all of the samples, the data will be analyzed to see which organisms are common to all cultures, which are not, which are unique to specific locations. This information is the first step to gaining a deeper understanding of how the microorganisms contribute to flavor, alcohol content and more. We are aiming for 200+ total samples to be analyzed in order to have a sufficient pool to draw conclusions. We invite you to take advantage of this opportunity to learn what is in your culture while also contributing to the deeper body of knowledge about Kombucha as a whole. Each participant will be provided a detailed report with all of the organisms present in their culture. 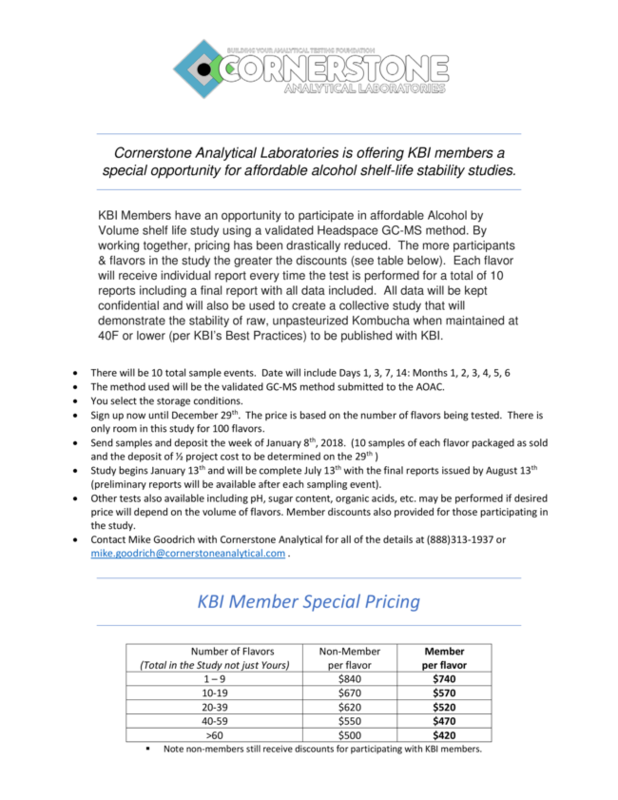 If you are a current KBI member, the cost is only $100 per sample. Part of the cost goes directly to the university to cover the sequencing, part of it is to cover shipping of kits and the purchase of the kit supplies and the rest covers administrative costs. Non-KBI members are also invited to participate!. The cost is $250 per sample for non-members. Or join KBI today to receive the member pricing. DNA sequencing typically costs several hundred up to thousands of dollars per sample, so this is a significant savings for valuable information. The data will only ever be presented in an aggregate format to protect confidentiality for all participants. We have a tight timeline (all samples need to be received by October 15th extended to October 30th! ), so please sign up today. We look forward to your participation and hope to see you at KombuchaKon18 – Defining Our Culture where the results will be presented.